When cooking, do you get frustrated trying to measure out a precise "dash" or "pinch" of an ingredient? Are you not satisfied until you're sure your celery has been "minced", rather than just "diced"? Well, it's time to let your inner obsessive loose in the kitchen, with this precision cutting board. The durable, beechwood board is clearly printed with absurdly detailed measurement markings, allowing you to chop perfectly square roots or calculate a slice of "pi" with absolute precision. Made in China. Wipe clean with wet cloth and soap, do not submerge in water. In the second image for this product profile the hand cutting the carrots is NOT using the guidelines!! At all! As a product marketed to OCD cooks... this is ironic and bothersome. Other than that, this looks like an awesomely useless product which I must purchase immediately. Looks nice, but it is way smaller than expected. We've had it for a couple of weeks and still haven't used it because a) it is ridiculously small, and b) I'm afraid if I use it the wood will stain. More of a decorative piece I guess but for me it is just taking up space. I wish I would not have thrown out the packaging immediately because I would be returning it if I could. I purchased this for my husband for our 5 year anniversary. Every year we buy the "traditional" gifts for that year. This year is wood. It is perfect because he loves to cook and is a little OCD. This was a gift for our son who is an avid chef. Our family has been involved with the Food & Wine industry for 3 generations and I was looking for an unusual, yet practical idea. I don't know about the construction yet, but it will get a lot of use and I expect this cutting board to hold up. Hilarious, perfect for my OCD husband! He loved it and sheepishly admitted to looking forward to using it to chop vegetables. Highly recommend! This was a good for a very good cook, who has most of the cooking equipment he needs. Everytime I am in the kitchen, I feel the need to measure something I am cutting and this a great gift for an engineer who is also a cook. Bought it as a gift for a friend. Was perfect!! Came as expected. This is so cool! It has lines for every chopping size listed in a cookbook. All my veggies are finally the same size! I got this cutting board for christmas from my husband, I was extremely excited but it's been only over a month and it literally fell into four pieces. I hardly ever use it but it was only like 4 pieces of wood super glued together. I thought it was one solid piece of wood and it seemed sturdy at first then ended up falling apart. Very disappointed. 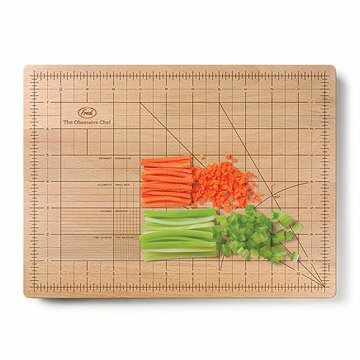 This solid wood cutting board is printed with obsessively detailed measurements for the ultimate in precision cooking.